Having checked out the beach area and infamous muscle beach funkychef decides to head for the back streets of Venice and decides to hit a 'few' bars.........starting the ball rolling Funkychef pops into a local doddgy looking bar on Abbott kinney street .........A groovy looking bar (once you get inside that is) the mood soon warms up as the night goes on. 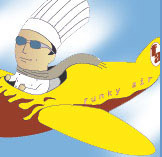 Interesting characters all around 3 inparticular attract the attention of Funkychef. A crazy Kiwi & quiet but just as crazy American and a very crazzy Italian chemist !!... these 3 locals look like suitable candidates to show Funkychef around a few more bars......... Canal Club, Venice Circle Bar on Main Street.